Governors frequently report on the state of their states, but what’s the state of the governors? To judge by many of the ongoing gubernatorial campaigns, it’s not great. Out of 36 contests, one governor (Neil Abercrombie, Democrat of Hawaii) has already lost his primary, another is headed for almost-certain defeat next month (Tom Corbett, Republican of Pennsylvania), and 10 others are in toss-up or close “lean” races. Perhaps most at risk beyond Corbett (with Abercrombie already done) is Gov. Paul LePage (R-ME), whose race we’ve rated as Leans Democratic since last autumn. In that contest, uncertainty remains because of the role of left-of-center independent Eliot Cutler, who finished a close second to LePage in 2010. Still, Rep. Mike Michaud (D) remains a slight favorite in the Pine Tree State. Six other governors are in better shape than LePage in our ratings but still have only roughly even odds of winning reelection. We’ve had Govs. Rick Scott (R-FL) and Dan Malloy (D-CT) in the Toss-up category since last year, but they’ve recently been joined by Govs. Sam Brownback (R-KS), John Hickenlooper (D-CO), and Sean Parnell (R-AK), the latter as a result of independents and Democrats forming a fusion ticket. Three other incumbents are not out of the water. Govs. Nathan Deal (R-GA) and Scott Walker (R-WI) have races that are in the Leans Republican category, indicating they remain vulnerable in what should be close, competitive contests (Deal may find himself in a December runoff). Rejoining them is Gov. Rick Snyder (R-MI), who now appears to again be a slight favorite over former Rep. Mark Schauer (D) in the Wolverine State’s gubernatorial battle. After Schauer pulled almost even with Snyder in the polls at the end of August and beginning of September, the incumbent regained a noticeable advantage in the polling averages, with a lead between three and five points. So we’re shifting the Michigan race from Toss-up back to Leans Republican. 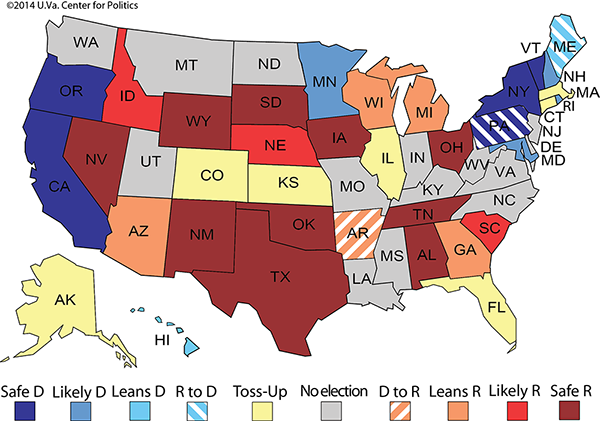 Source: Vital Statistics on American Politics 2011-12, Crystal Ball research, Center on the American Governor. Notice that the reelection rate for incumbents is usually in the 70th, 80th, or 90th percentile. Presidential years, which feature a far smaller number of gubernatorial races, have occasionally featured a 100% reelection rate (most recently in 2008 and 2012). In 2006, a tumultuous congressional election year that featured Democrats taking control of both houses of Congress, governors achieved their highest midterm reelection rate (96.2%), with 25 of 26 incumbents winning another statehouse term. The partisan trend in gubernatorial elections usually follows the congressional trend, in the sense that good Democratic years produce higher reelection rates for Democrats and vice versa for Republicans. 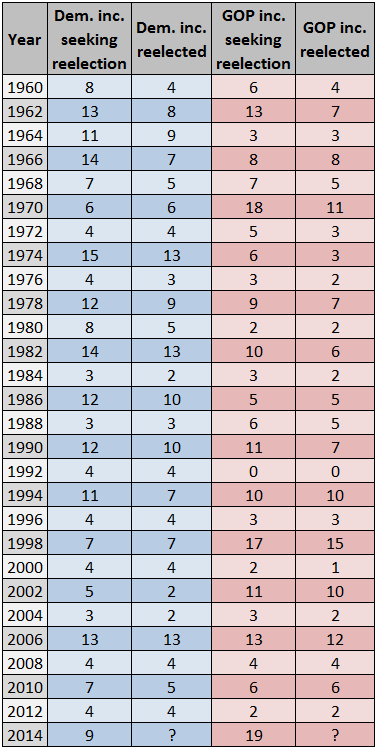 What is interesting, though, is that the trend is often muted in gubernatorial elections (see Table 3). For instance, in Democrats’ big year of 2006, 12 of 13 Republican governors on the ballot still won another term, while five of seven Democratic governors were reelected in the GOP wave year of 2010. Note: An independent governor sought reelection only once in this period, in 1998, when Gov. Angus King of Maine won. For a PDF of this table, click here. Source: Crystal Ball research, the Center on the American Governor. Such a dichotomous result — congressional elections going heavily one way, and gubernatorial elections failing to reflect the magnitude of a party’s wave — may reflect the divergent nature of the offices. While partisanship is always a very important element of voting, Americans evaluate their gubernatorial choices separately from those for legislative positions. In voting for governor, the residents of each state think about the issues at the top of their local agenda, and often the concerns are down-to-earth, bricks-and-mortar, bread-and-butter matters such as jobs, transportation, education, and the like. Foreign policy isn’t discussed in gubernatorial debates, as it often is in federal contests. Ideological social hot-buttons are in the mix at all levels, but they may be given a bit less emphasis overall than we find in elections for Congress. Leadership and managerial abilities are key elements in the voters’ appraisal of gubernatorial candidates, but less so for politicians running to be a part of a “collective responsibility” institution of 100 (the U.S. Senate) or 435 (the U.S. House). In a year such as 2014, when almost two-thirds of Americans say the nation is seriously off on the wrong track (according to RealClearPolitics’ polling average), it very well might be that voters are holding their governor partly responsible — possibly to a greater degree and a higher standard than their legislators. Most House districts are so skewed in such a partisan way that there is little opportunity for voter retribution in any event. By contrast, governors can be singularly credited or blamed for the state of public affairs, just like a president (who isn’t on the ballot) can be. Perhaps this is one reason so many sitting governors are fighting for their political lives on Nov. 4. Moreover, the highest number of incumbent governors since at least 1960 (28) is on the general election ballot, giving a large majority of Americans (79.1% of the population of the 50 states) a chance to register their approval or disapproval of the nation or state’s direction. In contrast, only slightly more than half of the nation’s population has a Senate contest this year. At the Crystal Ball, we don’t expect all the endangered incumbents to lose their posts. In fact, it is probably closer to the truth that only about half on the watch list will actually be ousted. Yet this would still be close to the largest number to lose in the last 40 years, six in 1990. And every one of these threatened executives, whether they eventually prevail or not, is being given a scare by their constituents. Possibly, in a sense, they are being “put on notice” to do a better job or to perform their duties with less controversy. This, too, is a useful function of the electoral process.